Highlight (use this guide) and/or journal your thoughts. Meet with friends in fellowship to discuss the week’s reading. Link to today’s reading online if you choose to read on-the-go. 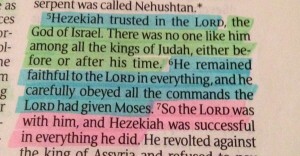 (NLT) Hezekiah trusted in the Lord, the God of Israel. There was no one like him among all the kings of Judah, either before or after his time. He remained faithful to the Lord in everything, and he carefully obeyed all the commands the Lord had given Moses. So the Lord was with him, and Hezekiah was successful in everything he did. Hezekiah trusted in, leaned on, and was confident in the Lord, the God of Israel; so that neither after him nor before him was any one of all the kings of Judah like him. For he clung and held fast to the Lord and ceased not to follow Him, but kept His commandments, as the Lord commanded Moses. And the Lord was with Hezekiah; he prospered wherever he went. 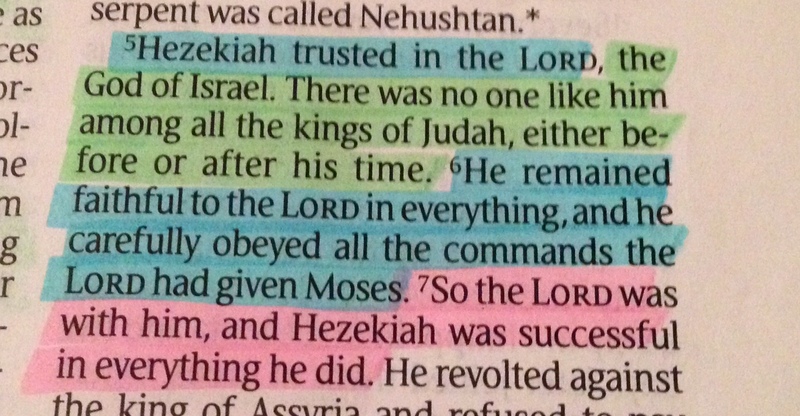 Hezekiah “trusted” in the Lord. The word trust here means a bold, confident, fall down kind of trust. It isn’t a stand on the edge and think about it kind of trust. It is a faith fall into the arms, the plans and the will of the Lord kind of trust. There was “no one like him.” His trust caused him to stand out among many. In fact, the texts says he stood out among everyone, that no one compared to him. He “remained faithful, clung to the Lord.” And, he “carefully obeyed.” This carefully obeyed has is root in “diligent guarding” – like that of a soldier or gatekeeper. This short passage holds so much. Hezekiah lived out his faith in a very real way. He was not all talk and no action. His faith was evident by the choices he made and life he lived. This passage says that he trusted with a bold trust. He stood out in the crowd not because of his good looks or fancy words, but because of his trust in God. That trust caused him to cling to the ways of the Lord. It caused him to live carefully, guarding his life with the wisdom of the Lord. And, because of this, the Lord was with him and he was successful. I want to have a faith like Hezekiah’s. Faith is trusting in all things, not just in some things. I want a faith that doesn’t hold back or hesitate, a faith that is willing to fall right in the the safe place of the Lord’s will, a faith that trusts in spite of what’s going on around me. I want to stand out, not blend in. I want my faith to move me to guard my life and my decisions with the wisdom of my God. I want the Lord with me; and the way that I ensure that is to stay inside the safety of His ways. His guidelines – written in His Word – will teach me wise behavior, they will fill me with insight. And that, will surely lead to success in many areas. Help me to trust You above all else. Let my life, my faith, my ways be DIFFERENT. Give me the courage to cling tightly to Your guidelines so that I can gain wisdom. In Your Loving Name, AMEN! His Word is truth! Let this song speak into your heart. Thank you for this challenge, I was definitely convicted today and the struggle is real. Hezekiah was real, (real for God). I was just telling my husband that so many of us define ourselves by what we do career wise and the success we achieve. We need to define ourselves by how we serve the Lord just like Hezekiah. He served God because his heart was in it, not because he wanted more things in life, a better job, better friends, or more money, but a true love and servant hood for the Lord that so many of us miss out on because we are too busy with our earthly success. Wow! Totally hit home for me today. Prior to the devotional I was reflecting on one of the verses from VBS – 2 Corinthians 9:8 “And God will generously provide all you need.” – and how often God has proven he generously provides all I need (actually MORE than I need), yet I still have anxiety from time to time that our needs won’t be met. 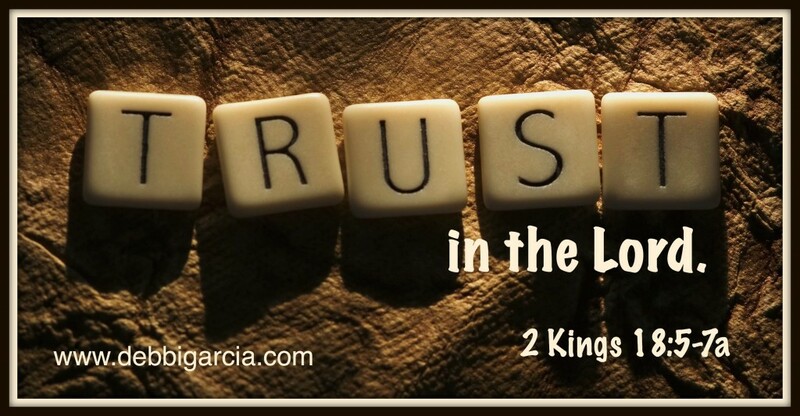 Then I saw today’s message – how convicting that I lack the trust displayed by Hezekiah. My prayer is that I will all encompassing trust in my God, the one true God. Lea’s comments also struck home – Hezekiah served God because his heart was in it, not because he wanted more things in life. Absolutely. Isn’t God’s word powerful and encouraging and full of whatever we need. Amen ! Well said ! At this point in my life my highest goal for success is practicing righteousness and obedience ! Setting my eyes on the things above and worrying less on the things of this world .